The 6,000 sq. ft renovation and expansion of Budimir Branch will begin Thursday, April 4. When complete, the branch will include more customer space, additional resources and technology. Design of the $3.5 million project was finalized in May 2018 and plans call for Budimir to remain open as much as possible during the 11-month build which will impact all sides of the facility. Effective April 4, parking at the branch will be suspended during the entirety of the project. On completion of the project in Spring 2020, a new parking lot will be available for your use. We apologize for the inconvenience and thank you in advance for your patience. 2 Responses to "Construction To Begin At Budimir"
A welcome expansion of Budimir Library as one of Windsor’s only two medium size Public Libraries. 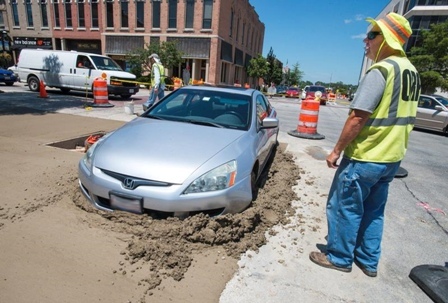 However, the photo of the automobile stuck in fresh concrete would be a more appropriate metaphor for what’s going to happen with the Windsor Public Library system when taxpayer citizens are going to lose their Main Branch Windsor Public Library this summer. Stuck in the muck for years because of City Council’s past mistake in selling the existing Main Library instead of legitimately looking to reactivating, sharing space, innovating and revitalizing the existing Main Library. Mr. Woodrow needs to find a better joke for the proposed transfer to the 5th floor of New City Hall of the so called ‘Main Library’. Show a real photo of that less accessible 5th floor closet space so we can all have an expensive laugh at the Mayor’s stuffed Library Board’s decisions! I agree with you 100% David Hanna.